By CPL. C. W. KELLOGG Roundup Field Correspondent BURMA - There were ghosts in the land last night. On Main Street, U.S.A., the goblins had their day and the witches made their annual ride on their broomsticks across the face of the moon - for it was that final fated day of October, day of the ringing doorbells and the missing shutters, and the snagged-toothed pumpkins - Hallowe'en 1945. TIMELESS TRIBUTE Cpl. C. W. Kellogg, Roundup field correspondent, sat down at his typewriter in Burma the morning after Hallowe'en and wrote to his credit, an the credit of those who died in the mountains and the jungles, The Ghosts of Burma. Hallowe'en is 15 days gone. So maybe you will say this piece is not timely. We say this tribute to the dead shall be timely so long as men live who remember their sacrifices. We think Cpl. Kellogg can take as much credit for The Ghosts of Burma as Sgt. Smith Dawless has for Conversation Piece. We believe it to be the kind of writing that the great critic, Alexander Woollcott would have clipped and put in his wallet. Like Cpl. Kellog, we hope we won't forget. - The Editor. known to a few as the Ledo Road, a new host of ghosts were abroad. No witches, these - nor goblins, but the water buffalo crept deeper into the thickets and little Naga children trembled in their mothers arms, and even Shan the Tiger lay with his belly on the ground and fear in his heart. The land was still and only the ghosts walked. High in the Patkai Mountains there was a meeting and the hills sounded with the beating of the conversation - for it was the talk of battle of rifle ball and pistol slug, and the deeper, hurried thud of the mortars. The sky was dark, for the moon was on the other side of the world where the witches played, but the sky wasn't empty. There were ghosts up there in the dark, and the sound of their passing was the roar of 1,200 horses, and their calling cards dug deeply into the jungle with a boom and a flash. At Myitkyina there was quite a convention - ghosts with white faces met ghosts whose skins were darker and some whose skins were yellow with centuries of life in the Orient. They prowled along the grass-crown edges of the strip up there and they talked in their own way about Joe Stilwell and Frank Merrill and General Sun. On down the river at Bhamo they gathered in the dark - these Burma ghosts - and looked silently at the temples and the foxholes besides those temples. There were music lovers among them and these sat in the deserted bomb crater near the mission and remembered a gracious little lady from "Paree" who stood on a hot day in the broiling sun and sang until she could sing no more. There were the ghosts of Mong-Yu, where the Ledo trace runs into the Burma Road. These ghosts wore suits of armor - 1945 version - and behind them came four-legged ghosts with big flapping ears, and a bray straight from Hell and an inquisitive look straight from Missouri. They wore the scars of sores on their backs and their legs ached with the miles of the mountains. Yes, ghosts walked in Burma last night. It was Hallowe'en. But they'll walk again tonight, and tonight isn't Hallowe'en, and tomorrow night, and it won't be Hallowe'en either. They'll walk there until The Road that bore them is nothing but a memory, until the reason they were born and left to be ghosts of this land fill only two pages of a televised or microfilmed history book. We wish them well, these ghosts, because, but for the grace of God and the breaks that come to a man, we might have been with them, and we are glad we aren't. We hope that we'll remember them, and perhaps we will, but the memory of man is a treacherous thing, and the chances are we'll forget. Only on dark and stormy nights in a driving rain will we remember, and because we hate to remember things we didn't like we'll turn from that rain and the wind to the lights of home. But the ghosts are in Burma, and because they are there the world is a different place, and though we may forget, the ghosts of the Ledo Road will remember, and they'll know, and they'll be satisfied. Several Revisions Noted Roundup Staff Article Under a revised system announced by Theater Headquarters on Saturday, no personnel with scores less than 52 will be embarked by Replacement Depots 2 and 3 at Calcutta, until all personnel in those depots with scores above 52 have been evacuated. Exceptions to this policy are low score personnel due for separation from the service under regulations which have been announced by the War Department for return of personnel for reasons other than scores, personnel ordered to the U.S. on re-enlistment furloughs, key personnel required for administration of a Category IV unit, low score personnel with Category IV Air Force combat units who lack the necessary qualifications for reassignment to a service unit within the theater, patients, medical officers including nurses but excluding MAC, and personnel ordered to the U.S. to some special organization for permanent change of station. The above will apply to both China Theater and India-Burma Theater personnel in Replacement Depots No. 2 and 3, and concerns all personnel now in those depots or who arrive in those depots in the future. Theater Headquarters further announced that China Theater units arrived or arriving at the West Bengal airfields for staging will not move to depots during November. These units will be governed by the same procedures as are applied to India-Burma Theater surplus units not being moved to depots during November. Their personnel with scores of 60 and above and personnel eligible for release for other reasons such as age will be moved to Replacement Depot No. 3 for return to the U.S. as casuals as indicated in Theater Circular No. 158. This system will result in China Theater personnel on the West Bengal airfields moving to Replacement Depot No. 3 according to their ASR scores of 60 and above, on the same dates that India-Burma Theater personnel with similar scores will be moving to replacement depots. On November 7, China Theater enlisted personnel with scores of 70 and above and officers with scores of 75 and above now assigned to Category IV units in the West Bengal airfields were ordered moved to Replacement Depot No. 3 as soon as practicable. Prospects are that the last of the men of both the India-Burma and China Theaters with scores of 60 or above, excepting volunteers and personnel with critical MOS, will be on their way to the depots by the end of November, either as casuals or within units. During the past week, Theater Headquarters directed that in so far as practicable, the first of the Category IV units ordered to Replacement Depot No. 1, Malir, from Assam, during the remainder of November to be composed of the highest score men now within all such units and the last of such units be composed of the lowest score personnel. The total number of troops within such units is approximately 9,000. The War Department point score system remains the basis for moving troops to India-Burma Theater staging areas. The one exception is that personnel already in surplus units with scores between 52-59 are being permitted to remain in these units. The Theater unit critical score was set at 52 on the basis of calculations which indicated that such a score would dispose in a practicable manner of the number of personnel not needed in the Theater. The "unit critical score" of 52 was also selected in anticipation that the War Department would gradually lower the critical score for the U.S. Army to approximately 50. Actually the War Department score so far has been gradually lowered to the present figure of 60. However, the War Department has announced that personnel now in the U.S. from overseas theaters on emergency leave, temporary duty, or similar status, who have scores of 50 and above, will not be returned to their theaters but will be separated from the service. It follows that men being returned from this theater in surplus units with scores of 52 and above will in all probability be eligible for separation from the service upon arrival in the U.S. It is obviously impracticable to withdraw from surplus units personnel with scores of 52-59 except in case where their services are definitely known to be needed in the task of disposing of theater property and inactivating the theater. Men no longer needed would require to be supplied and fed if left in forward areas which would cause a delay in closing out the theater. If sent to staging areas or withdrawn from surplus units already in staging areas they would rapidly fill up available staging space needed in the movement of other troops. Although the present system of allowing them to remain in surplus units, when they are already in such units, results in a degree of delay in the return to the U.S. of higher score men, at the same time it has resulted in expediting the over-all inactivation of the theater through the removal of surplus troops from forward areas and through keeping theater staging areas clear. No change has been made in the method of determining priority for embarkation on ships among those troops in the depots who are eligible for embarkation. As previously indicated, withdrawal from surplus units and retention in the depots of men in surplus units with scores of 52-59 would soon clog the depots and prevent other troops from coming in. A policy of embarking troops exactly according to score would have a similar effect. Continual readjustment and re-preparation of orders and ship passenger lists would be necessary as each day's quota of troops arrive at the depots. Such would be impracticable and would serve to slow down the over-all evacuation of the theater. The present policy is that those troops eligible for embarkation who have been longest in the depots have priority for embarkation on the next available ship whether they be casual personnel or personnel in units. No distinction is to be made between casuals and units under this policy insofar as practicable. However, exceptions may occasionally be made to this policy because of the many factors which influence the loading of ships and because every effort is being made to expedite the turnaround of ships in order that they may again return to the theater to embark further troops. Those who were on the fringes of the atomic bomb project, people like Lt. Stanley J. Skripsky, were in the position of the rustics watching the shell game at the country fair - the peas was there, all right, but damned if they could glimpse it. This admission is made by Skripsky, recently-arrived assistant Provost Marshall, New Delhi, in describing his 10 months on the guard detachment at Los Alamos, N.M.
Until Hiroshima and Nagasaki were seared by atomic bombs, Los Alamos was an obscure speck on the map, 45 miles northwest of Santa Fe. Then it was disclosed that it was here the first large bomb was detonated, ushering in the awesome era of atomic energy. "We didn't know from nothing," confessed Skripsky, a husky, corn-fed product of Omaha, Neb. "When we arrived at Los Alamos, we were told that the work being accomplished was important beyond all imagination and were sworn to secrecy. The pledge was easy to keep, because if we'd been able to shout all we knew from the housetops it would have given aid and comfort to no one." Los Alamos literally blossomed overnight off the mesa floor among sleepy Indian pueblos, Skripsky told the Roundup, "I've heard various estimates of its population," he said, "but although people differed on the exact figure it was generally agreed that it was New Mexico's third largest city - after Santa Fe and Albuquerque. "The site of the project is situated on a mesa on the edge of the Los Alamos Ranch School, which had catered to wealthy easterners. It is an extremely beautiful region, 7,000 feet above sea level, between the majestic Sangre de Cristo and Jamez mountain ranges. I've read that it is a desert area, but that's a lot of bunk. I'm sure the vegetation and trees I saw weren't mirages." Los Alamos, admitted Skripsky, was not entirely rumor-proof, but there was none of the open flow of latrine-o-grams common to ordinary G.I. society. "This, " he declared, "was not only because of the secrecy pledge but also because of the numerous security personnel, actual and suspected, on the project. Talk and you might be speaking to a member of the CIC or FBI. By the same token, no one would chance speaking to you." Member of the project, of course had their letters rigidly censored. It was, according to Skripsky, difficult to write more than "the weather's fine and I'm okay." Everyone had a post office box in Santa Fe. There was an intricate badge system and method of identification that made it impossible for any wandering about the numerous restricted areas. TABLES ARE TURNED Remember when the Army took over Montgomery Ward's Chicago plant and two soldiers gave Manager Sewell Avery the bum's rush? Well, the Army recently returned the management to Avery, so two Ward employees replied in kind by evicting Cpl. Joseph Tobys from the store's premises. It's all in fun. was plenty of entertainment. PX's were well stocked, the EM were subsisted on garrison rations and the area was abundant with day rooms. "We had a large fund," added Skripsky, "and were able to give the EM a party once a week." The MP's chosen for the project were picked men from the MP Replacement Training Center, Ft. Riley, Kan. They were the first mounted Military Police unit; and they were selected because horsemanship was a requisite in the Los Alamos region, which was roadless in its early days. They were told they were going overseas into combat and didn't learn about their real assignment until arrival in New Mexico. Skripsky would not disclose complete details of the security system followed by the MP's but talked freely of sound boxes on fences, floodlights, radio communications and wire enclosures with machine guns in towers. "One of our most frequent assignments," he said, "was to establish road blocks to seal off areas where experiments were in progress. Mysterious technical equipment would be installed by tight-lipped men, then a small group of scientists would arrive. Later we would hear detonations. "Once a confidant told me that he had driven a tracked vehicle into one of these areas and the treads had later disintegrated. I considered that one a tall tail." On another occasion, Skripsky was brought into one of the test buildings where the top scientist worked to guard a small wrapped package. Before he could enter the room, he was ordered to put on rubber boots. In June, a month before the big detonation on July 16, the lieutenant accompanied an emergency four-vehicle convoy to Ft. Douglas, Salt Lake City. It consisted of two insulated ambulances protected by two sedans. "Nothing that happened, however, revealed the tremendous impact of the project," said Skripsky. "Everything served to confuse rather than to explain. People worked independently of one another on different phases of the bomb and yet, of course, the small core of top scientists who directed activities were skillfully correlating their efforts to achieve the end product." No outsiders were allowed in the area. The only exceptions were officially-designated inspectors for the Manhattan Project. Other military and civilian personnel frequently arrived to visit Los Alamos (including the Truman Committee) but they were refused admittance to their bewilderment and sometimes indignation. Returning to his command in China after a brief stay in Washington, Lt. Gen. Albert C. Wedemeyer this week found himself involved in a long-range controversy with Communist leaders who renewed charges of United States intervention in China's civil war. Answering Gen. Yeh Chien-ying, Communist Chief of Staff in China, who had reiterated his charge that United States forces were interfering in China's private affairs and had indicated his government may claim compensation for "damage to life and property." Wedemeyer denied the intervention allegation, but admitted United States troops had been caught in "minor skirmishes." The China commander also announced that American Marines in North China would be withdrawn as soon as their mission was completed and that the first of an estimated 50,000 men might start returning home this week. Wedemeyer did not divulge the nature of the mission they were to accomplish. Wedemeyer predicted that United States forces in China would be out of the country by early spring and asserted that the United States would not help the Central Government move troops into Manchuria. He emphasized, however, that the United States would continue to assist in the repatriation of Japanese from the China Theater but added that American forces would remain "nonpartisan" as far as strife between the Central Government and Communists is concerned. In Washington, Secretary of State Byrnes revealed that the State Department had not been consulted before Marines were sent into North China. The secretary declared that plans are underway for the withdrawal of Marines from North China. He insisted, however, that the dispatch of Marines to the Communist-controlled area and the transportation of Chiang Kai-shek's Central Government troops from South to North China in American warships was purely a military move by the War Department to effect the surrender and demobilization of Jap troops in that area. Byrnes said he had investigated reports of civil war in North China and had found them to be "exaggerated." He added that he was unable to verify reported clashes between American and Communist troops. Letters addressed to the Roundup within the past several months indicate that many G.I. 's and officers are unfamiliar both with the proper procedure of submitting complaints through official channels and with benefits to be derived from following the prescribed system. Army regulations recognize that any enlisted man or officer who believes himself wronged has the right to be heard, either orally or in writing. 1. A letter will be addressed to the immediate commander, but should the complaint directly implicate that commander the letter may be addressed to the next higher command, through the immediate commander. CAN YOU TIE THIS ONE? Introducing: The "Handkerchief Sarong" and Sylvia MacNeill, a Walter Thornton model. All you do is take three large (?) handkerchiefs, tie 'em together and here's what you get. Slick, huh? 2. - If, after a reasonable period, the letter does not result in action correcting the grievance, another letter may be written directly to the next higher commander. 3. - If neither of these actions result in a satisfactory settlement of the grievance, the complainant may write directly to the General Officer commanding his unit or to the Theater Commander. Oral complaints may always be made to the immediate commander who, if it is within his power, will take immediate corrective action. When such a complaint requires action by higher headquarters, the immediate commander will initiate the required communication to obtain the proper result. He is obligated to notify the complainant he has taken this step. In addition, it has always been the custom of the Service that grievances may at any time be presented in person to Inspectors General of any command. Inspectors General, during their annual inspection of a unit, always set a definite time when any member of the unit being inspected may personally state his grievances in confidence. I.G. teams are presently inspecting Class IV units prior to their evacuation from the India-Burma Theater. Addressing communications other than through proper military channels usually tends to delay corrective action since, in most instances, it is necessary to refer the letter to the immediate commander in order to afford him opportunity to make necessary comment. Communications expressing complaints must be specific, giving names, dates, locations and events, together with all pertinent information relevant to each particular complaint. Action to correct matters which form the basis of complaints is a function of command. It may be expected, therefore, that corrective action will be taken promptly by the commanding officer to whom complaints are made. If corrective action is beyond his jurisdiction, he will forward such complaints through military channels to insure that the complaint reaches the attention of the commander having the authority to take corrective action. Normally, complainants should hear of the action taken on their complaints. SAN DIEGO - (ANS) - Benjamin Watson Stilwell, 18, handed his father a surprise when he joined the Navy. "Father" is Gen. Joseph W. Stilwell. A few weeks later, the General returned the surprise by visiting his son, now a seaman, at his naval training center. "He looks swell," reported the older Stilwell after the visit. "I almost joined the Navy once myself." NICE SHOOTING, 'SPECK' Lt. Gen. Raymond A. Wheeler, known to his "town folks" as "Speck," took time out for a rest at his Peoria, Ill., home recently after serving overseas since 1941. 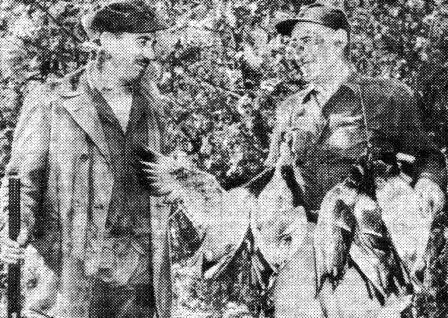 Here, the former India-Burma Theater commander and onetime Deputy Supremo under Lord Louis Mountbatten in Southeast Asia Command, examines his limit bag of ducks held by Ross Logau, head of the duck hunting reservation near Peoria. Lt. Gen. Raymond A. Wheeler, former commanding general of India-Burma Theater, took time out from duck hunting at his Peoria, Ill., home recently long enough to voice his dislike for statistics, remarking, "If all statisticians were laid end to end it would be a damn good thing." 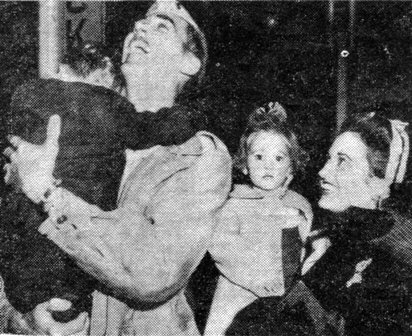 Guest of honor at a "Welcome Home" dinner, the newly appointed chief of Army Engineers, according to an article printed in the Peoria Journal-Transcript, spoke not as one of the country's highest-ranking military men, but as "Speck" Wheeler, the "boy who left Peoria 40 years ago to embark on his career at West Point." "The two most important factors in the winning of World War II were America's powers of co-operation and production," Wheeler told the gathering of "town folks" at the dinner, which climaxed General Wheeler Day. Fellow Peorians presented their "most illustrious warrior" with a plaque "in recognition of his accomplishments in war for the sake of peace." The Journal-Transcript pointed out that the general's "keen sense of humor was reflected time after time as he told of incidents along the far-flung China-Burma-India war fronts," but declared, "Wheeler gave a matter-of-fact account of his travels and experiences. Not once did he speak of the dangers and hardships attendant to his tremendous task." In conclusion, Wheeler told his fellow townspeople: "We must keep building." Capt. Morton M. Lenrow is a slender, aesthetic gentleman from New Jersey with an appreciation for history strengthened considerably this past week when he received orders to return to the United States with two recently completed volumes of the India-Burma Theater History. The Theater history which Lenrow, a member of the Theater Historical Section, is escorting back to the War Department consists of two bulky volumes bound with manila covers bearing gaudy CBI patches. The tomes weighed nearly eight pounds and are comprised of 524 pages of typewritten copy, Signal Corps photographs, sketches, charts and graphs. The two-volume history covers the mission of the India-Burma Theater under Lt. Gen. Dan I. Sultan, from Oct. 25, 1944, to June 23, 1945. The earlier history of the China-Burma-India Theater was returned to Washington last December. At present, six men in Historical Section are gathering data for the final summation of Theater activities - a job which will be completed when the last man walks up the gangplank of the last troopship. Lt. Col. Harry L. Mayfield, Theater Historical Officer, sums up his section's job with a shrug and a doleful prediction: "We'll be the last men to step on a boat in this Theater. And even then we'll probably have to record that event on our typewriters after we've walked up the gangplank." Compiling a Theater history, Mayfield confided, isn't something that's done in a casual manner during one's spare time. Work on the two volumes completed last week was started last August by a staff of six officers, one enlisted man and six Indian typists. The manuscript was revised three times. "An Army historian has to be an expert snooper," Mayfield said. "We poke our noses into everybody's files, chase down rumors, interview hundreds of persons." The biggest headache of the historians - a factor which has earned them the nickname of "Hysterical Section" - is that every definite statement written into the history has to be double-checked and then documented. Even known facts obtained through interviews with responsible persons have to be credited to such official sources as Army radios, special orders and official correspondence. In the recently completed history, more than 2,000 such statements were documented. The history writing business has its chuckles, however, many of which turn up in histories written by individual units. Personal items such as a note in one unit's contribution that "Our men determined to have a blue border painted around our mess hall" or a history of a QM unit which had but one photograph attached, a picture of a colonel pinning a medal on a plump, giggling female civilian, always are good for a laugh. Accompanying the Theater history to Washington will be a five-volume history of Services of Supply in India-Burma, a three-volume history of Burma's Northern Combat Area Command and a one-volume India-Burma combat history. The main India-Burma history covers the broader phases of the prosecution of the war in this Theater, including the job done by the Air Force, the campaigning of the British 36th Div., along Burma's Railway Corridor, activities of the Chinese armies in Burma and progress of the Ledo Road. The other volumes record the smaller details of the job. EDITOR'S NOTE A new British Army magazine Astra, appeared in Delhi this week, published by the RAF Signals Center under the editorship of Cpl. John W. Hazzlewood. In its initial issue is an article by and about Sgt. J. D. Stine, departed announcer for VU2ZY, which appears at left. Commenting on the recent Indian press controversy about AFRS programs, Astra's editor puts forward the opinion that most British servicemen prefer them to other programs available. Hazzlewood says, "Naturally there are our favorite British features which we wouldn't switch off for "Jill" or any other American favorite; and there are American features which don't appeal at all because they are - and rightly so - domestic in character. "On the whole AFRS gives an excellently varied program, and most fellows will be very disappointed when we can no longer hear them. A lot of foolish remarks have been made in the recent controversy, which should be forgotten. People want to get a sense of proportion and perspective, not take petty things so seriously." J. D. Stine, for eighteen months your Breakfast Sweetheart on VU2ZY, has returned to America, and the 0800 watch are no longer eased from their charpoys by his friendly voice and the favorite tune he presented. Before Jack knew he was "on the plane" we asked him to give RAF Signals a more intimate picture of himself and the Station. Since then many things have happened - several of the original VU2 staff besides J. D. have said goodbye to Delhi, and at least one more familiar voice, that of Bill Stulla, will disappear before our next issue is out. It will be a sad day when the station closes, not only for RAF Signals fans, but for everyone in Delhi who has experienced so much pleasure from the bright programs; and that means everyone with a radio within 25 miles of the transmitters. When the network was at its peak, there were sixteen of these Armed Forces Radio Service stations in India-Burma; at Delhi, Chabua, Gaya, Karachi, Agra, Calcutta, Tezgaon, Lalmanarhat, Ledo, Jorhat, Tezpur, Misamari, Myitkyina, Bhamo, Kandy and Shingbwiyang. Delhi was the first - but let J. D. tell you the story, in his own words. Dear people: That's not much of a salutation, but I couldn't very well be more specific. So you want a story on "Wake Up and Live," VU2ZY and myself? Well, there's not much to tell about myself. My home is Plainfield, New Jersey, where I was born June 21, 1921. That makes me 24 years old. I'm six feet tall and weigh around 170 pounds - how many stones that is I can't say. You'll have to figure that out yourselves. My father is a teacher and my mother's a mother; there just doesn't seem to be any other way to describe her. I'm not married and I have no prospects of getting married. I believe the word is "unattached." Most girls think I'm fresh, I guess. I've one brother, a captain (U.S. Army) who is in the Philippines. I've been in the Army for about three and a half years, assigned all the while to the Signal Corps. Before coming to New Delhi, I was stationed in Washington, D.C., for a year. I arrived in New Delhi on December 1, 1943, and, save for two leaves of absence, I've been here ever since. The Armed Forces Radio Service (AFRS) sent a three man team, consisting of one officer (Capt. Robert Black), one technician (Sgt. Eskill Holt) to install and maintain AFRS transmitters, and an experienced announcer (Sgt. Bill Stulla) to New Delhi to proceed with setting up what is now known as the India-Burma Network of AFRS. This was hardly enough of a staff to keep a station operating, so they looked around for help. Shortly afterwards they enlisted the services of Sgt. Chuck Whittier who, as a civilian, had done radio work in and around Philadelphia. About a week before VU2ZY went on the air, I volunteered to help my OIC, Captain O. W. Stephenson, Jr., in running an early morning recorded program as a spare time venture. We were in no way assigned or attached to the radio station. We simply went to the studio on our way to work, you might say, and did the program. But after we got things running Captain Stephenson found that his regular Army job took him out of town too often for him to maintain the regular schedule. For that reason he gave the project up and I fell heir to "Wake Up and Live." The "Breakfast Sweetheart" idea came to me after I'd been on the air about three months. One morning as I was signing off with my original theme "Little Brown Suit," I had a mental picture of soldiers all over town getting out of bed. You've all seen the act yourselves, I'm sure. It's better than lunch time at the zoo when guys get out of bead swearing and scratching and blinking in the early sunlight. I thought I'd rub it in a little by emphasizing their discomfort and the inadequacy of Army life, so I let go: "This is your breakfast sweetheart saying good morning." At the time I hadn't the courage to give my name. You see life in those days was dear, a lot more so than it is now. About a month later I finally put in a name-claimer for myself and in less time than it takes to say it, I became "J. D. Stine, Your Breakfast Sweetheart." The "J" stands for Jack and the "D" stands for Darby. The "Stine" stands for Stine. Finally I brought the sign-off up to its familiar stature by Indianizing the very famous Damon Runyon quotation, "I gave him the big hello," so any morning you cared you could hear "This is J. D. Stine, your breakfast sweetheart, giving you the big salaam" at no extra cost to yourselves. It was one morning in September that Jack said his last verbal salaam to us. So many guys crowded round the mike for the event that Jack was unable to say all the little things he intended. He had planned to salute "D" watch, who for long had bombarded him with requests. It all started with a broadcast of "Don't you know I care?" linking up two members of the section, and the habit caught on. Most mornings J. D. received a note or phone call, sometimes the reply to the crooned sentiments of a former program, or even the last record. J. D. would excuse himself at the mike to answer the phone and the caller would return to his loudspeaker in time to hear the request. Such was the Stine service. The great charm of the program was its informality. While Jack was on the air, the studio was always wide open to anybody who wanted to drop in, and visitors were frequent and varied. He never made any effort to have "Wake Up and Live" a dignified program; there was never a script and he never bothered with any preparation, always saying "Writing scripts is too damned much work. Besides, people are always phoning while I'm on the air to have tunes played on the spot, so what's the good?" Almost always he found enough requests in his mail to fill an hour with ease, but if there was time to spare he just played anything he could lay his hands on. He soon found out what sort of stuff his audience wanted to hear and with the recording library at VU2ZY as big as it is (over 10,000 sides) it wasn't difficult. The fact that he was never hampered by a script allowed a lot of room for horseplay with friends, Whittier and Stulla. "Those boys are two of the finest guys in the world and excellent radio men to boot. Chuck, Bill and I have had a lot of fun together in the past year and a half, meeting people with whom we were already friends through the station. I know I speak for them as well as myself when I say that the very kind reception given to us over the air is the most heartening thing in our overseas experience. It's made the work at VU2ZY more fun than anything else and has prevented our getting bogged down in something which might otherwise have been so much ho-hum. I can't say how much longer VU2ZY will be operating, because of the redeployment of U.S. troops in India-Burma, but now I've had the final cue to sign-off for good. I'll always remember the fun and the privilege it's been playing "Breakfast Sweetheart" to the early risers in Delhi. It has meant much more to me than I can say." With that Jack sends readers his last Big Salaam. A few weeks ago the boat took him from Karachi to his discharge. He intends to continue his studies now, and hopes to become a teacher. We wish him the best in all he undertakes, and send our thanks for the happy moments he has given us, at the same time welcoming Steve Arnold, his successor. Chuck Whittier has gone back on discharge and will resume his sports commentaries for the Atlantic Refining Company, Philadelphia. The Don Lee - Mutual Network will soon have the technical skill of Holt at their service, and next month Bill Stulla expects to leave Delhi bound for K.F.I. Los Angeles (N.B.C.) 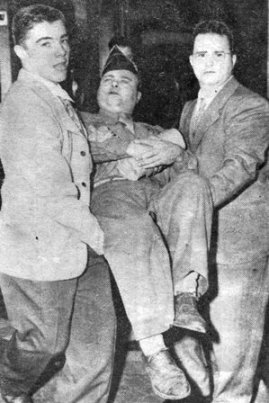 upon his discharge. Captain Stephenson has already returned on discharge but not to radio work - he is Professor in Economics at Tulane University, Louisiana. From all theaters where U.S. forces have operated, men of the Armed Forces Radio Service, whose headquarters are at Los Angeles, are returning to the States. It has been a wonderful organization - did you know there were 42 AFRS stations in the U.K.? - and has brought pleasure and information to millions of people. In a parade of stars, music and humor they were able to hear the best of America's artists, provided by commercial concerns but without advertisements. It was goodwill on a vast scale. SHANGHAI - Col. Westray Battle Boyce, director of the Women's Army Corps., arrived recently at Lunghwa airfield, it was announced by Maj. Beryl M. Simpson, WAC director in China. Col. Boyce is in Shanghai to inspect and co-ordinate WAC activities in the China Theater. The WAC Detachment quarters will be visited during her tour, as will offices in which WAC's work. Her program includes a meeting with Gen. George E. Stratemeyer, USAAF China commander. For "meritorious service during the period from Aug. 10, 1943 to Aug. 10, 1944," Col. Boyce was awarded the Legion of Merit and citation orders which show her to be the first woman so honored. She resigned her position with the Federal Government in 1942 to become an enlisted woman in the Women's Army Auxiliary Corps. 'DADDY COMES HOME' There were definitely mixed emotions at the recent homecoming of Lt. Earl Pizzo after a year's service in China. As Daddy stepped off the train in Houston, three-year-old Thomas Earl happily jumped into his arms. Mrs. Pizzo was also happy about it. But two-year-old Winnie Jo wasn't too sure about "the stranger" and seems a bit bewildered by all the noise. CHUNGKING - (ANS) - Liao, the houseboy at the Press Hostel here, crisply decked out in G.I. clothes and tipping a coolie to carry his second-hand footlocker, has left Chungking for Shanghai, an act convincing almost everyone here that Chungking is on its last legs as the eight-year capital of China, the New York Times reports. The government has announced that the capital will be moved to Nanking as soon as conditions return to "normal," the time being variously estimated at three to six months. But Liao, peddlers' middle man, exchange broker and gin and vodka salesman as well as houseboy, got out of the market before the bottom dropped out. As he left with "friends" and with two deals already lined up in Shanghai, this commercial dervish, with buckteeth and a slim but tenacious hold on the English language, told important last-ditchers: "Why you no come Shanghai? Chungking, she done." Less fortunate than Liao, in view of the transportation shortage, thousands of other refugees are making plans to get out of Chungking and return to the coast by way of the Yangtze River. Their haste is great for there are only about 20 boats to transport them, and the Yangtze becomes too shallow in winter to allow steamers to pass the treacherous gorges near Ichang. So far only one riverboat, carrying 500 passengers, has made the 10-day trip to Shanghai. River passengers must get priorities from the Ministry of Communications. Air priorities are given by the Executive Yuan and are reserved now for government officials, but the China National Airways Company will make some plane seats available to civilians this month. Almost every night refugees peddle their belongings in the damp, musty darkness by the light of candles and garlicky-smelling carbide lamps. Blankets, bedraggled furs, blouses, trousers, teacups and rusty padlocks are strewn over the broken pavement in a lively mart where the chief desire is to acquire passage money and a stake to get to the coast. But the streets, once filled with jeeps, weapons carriers and trucks, are emptier, now that the U.S. Army headquarters has moved to Shanghai. It is estimated that there are only 400 enlisted men and officers left, most of them itching to test the fables portraying Shanghai as an oriental Babylon. There is a sign of the times in newspaper advertisements heralding news of "cheap sales" and even houses for sale. The latter is a phenomenon in Chungking, which was and still is, in most respects, the most crowded capital in the world. The influx of refugees keeps the population at more than 1,000,000, at least five times what it was when Chungking was proclaimed China's wartime capital on Nov. 20, 1937. So long as the Government remains, and with it the foreign embassies, Chungking cannot lose its identity as the capital even though the drab buildings give it a shanty-town aspect by comparison with Washington or London. Communist and Kuomintang politics are still discussed in the teashops and embassy receptions continue to attract a colorful assortment of uniforms. Chungking has even developed a night life since the end of the war as a result of the completion of several night clubs originally planned for the Americans. MYITKYINA - The center square of the town had been ready for days; small colorful paper chains adorned all the bamboo poles that fenced in the town square. A large paper sign reading "Welcome" is glued at the main entrance, others reading the same, although smaller, are pasted all over the side bamboo poles. Durga-puja was the occasion; something equivalent to our Christmas. A pole about five feet long and with symbolic carvings on it stood in the middle of the small bare square with chalk lines forming a geometrical design. The holiday lasts several days; but the day this was written was the sacrificial event; and for this group of American-supplied Kachins and Gurkhas - the main event. The square is now almost completely surrounded by the waiting people. One side has been reserved for us G.I. 's; another side for male Burmese and next to this a side for the women and children; with a guard keeping an open aisle from the square to the market, a short distance apart. The last side is taken by a large basha, from where diligent priests emerge occasionally carrying the old dilapidated prayer books or the sacrificial knives. The women, a mixture of Kachin, Naga and other less defined Burmese stock are at their prettiest. The well-to-do, with fancy shining sarees of exquisite silk and gold embroidery and a satisfied but yet reserved smile, stand in front of the rest of the women. Everybody is at his best. The soldiers with clean uniforms in which it is not strange to find two or more G.I. garments, blended with the rest of the white clothed people. The children are also at their finest, and a constant murmur of voices and giggles pervades the place. The sir is clean, the sun is just beginning to be felt, and the unusual neatness and cleanliness can only mean long prolonged planning for the holiday. Two Burmese, dressed as women, suddenly appear and dance, following the rhythmical tempo of a drum. The drummer with his drum, and another Burmese dressed in male attire, soon joins the first dancers in a somewhat catchy little dance that keeps repeating itself over and over with the same few steps. The dance takes its participants from one side of the square to the other. It is the women who seem to be the most interested in the dance, and their envy of the poise shown by the dancers is apparent. A rather old man clothed by an immaculate white sheet, enters the square with great dignity and very carefully squats at one of the corners. after pronouncing a few orations, which some of the Burmese repeat, he builds a small fire with small shavings of aromatic weeds and woods. Small containers with rice and other cereals are sprinkled with water and more prayers follow. A few of the ignited shavings are placed on the surface of a watermelon, and after a while, more prayers and orations follow. An assistant to the preacher brings in some small pots, in which grow almost completely white weeds; one of these pots is placed at each corner and one on top of the central pole. A very large, brown, male goat of the so called Naga variety was brought in by two men. The goat was sprinkled with water; the white weeds were offered to him by the priest. The animal seemed to enjoy these weeds very much, judging by the way he ate them. The goat was then taken aside; a third man parted the goat's hair on the neck. After this, an Indian captain, feeling the edge of a fine kukri knife, stood in front of the animal. One swing and the head rolled. At the same time, a volley of shots from the guard and a treble sound of an army bugle was mixed with the thunderous yelling of the populace. A husky Burmese, picking up the hind legs of the animal, dragged it around the square while the blood dripped from the open neck. Two more goats followed: one black, and another brown and white. Both of them male. They were much smaller than the first. Again one or two swings of the knife and the heads fell. A large, dark gray, young bull made an appearance from the market place amid the shouts of the people. With a rope around his neck, and another holding his horns, the animal was pushed to the middle of the square and the neck rope was pushed through a large orifice on the bottom of the pole. This way the bull's head was lowered to ground level. After the water sprinkling and blessings, the bull seemed to have guessed the intentions of the priest, and after mustering all its strength, managed to push away from the pole and run amok for a very short while. A general retreat by Burmese and G.I. 's took place in the close vicinity of the brute. The bull was again placed in the right position; but this time they took the precaution of trying his front and hind legs. A three-foot Gurkha knife was the chosen weapon by the new ceremonial executioner, a young and tall Burmese. The head fell and the blood flowed in spurts from the severed body. The volley of shots and bugle call was again heard, and again the carcass was exhibited around the square, only this time the path of the body was marked by small pools of bright red blood. When the head fell, a small, fine-featured Red Cross girl was seen running away from the crowd with a handkerchief over her mouth. The sacrifices continued. Another bull was brought in, a bit younger and smaller than the first, but as stubborn and distrustful. When the second head rolled, another volley of shots and bugle calls followed. Again, as in previous cases, the animal's body was exhibited. A succession of ducks, pigeons, and other birds followed the path of the first goat. After the last animal was beheaded many older people approached the bloody dripping heads of the dead animals, and, touching the warm blood, said prayers. Others dipped their fingers in the blood and smeared it on their prayer books. Other zealots preferred the oozing blood of the neck. All this was done with great respect and ceremonial procedure. A priest entered carrying a large brass tray in which there was a watermelon cut in half with a burning candle placed in the middle and smaller pots with herbs and rice and other cereals around it. As this man's tray approached the people went forward and warmed their hands for a second or two on the flickering flame, and deposited a few annas. All the executioners were rewarded by the honor guest, a first lieutenant, with a small monetary present. A small, symbolic piece of white cloth was wrapped around the head of each executioner by the officers. The group of dancers then resumed their seemingly never-ending dance amid the loud cheers of the multitude. Wherever G.I. 's have been stationed in India-Burma-China, they have found a "touch of home" provided by missionaries. During long monotonous months in out-of-the-way stations, American soldiers have discovered that such persons as Dr. J. W. Cook and Miss Victoria Christensen of Assam Valley, Dr. Harry G. Fisher of the Tibetan Border Mission, and Miss Cornelia Morgan of the Tsuyung Bethel Mission on the Burma Road have always had an open door for the G.I. regardless of color or creed. This week, the Rev. J. B. Devine, Catholic missionary in the Bhamo area in Central Burma, in a letter to the Roundup, presents the other side of the picture: the appreciation of the missionaries for the many little kindnesses of the American soldiers. "I would appreciate a little space in your newspaper to thank two Engineer units, the 1905th and the 209th, for their many kindnesses to me. And, from all I have heard, I believe that other missionaries all over the Far East could tell similar tales. "Last May I returned to my mission station after three years internment under the Japanese to find that my house, church, school and the entire village in which they were situated had been burned. The 1905th Engineers 'C' Company was encamped nearby and I was kindly allowed to pitch my tent in their area. The following five months were the happiest I have ever spent, and what a contrast with the preceding three years! During those months I got to know men whose friendship I will cherish and remember for the rest of my life. I received from them kindness, consideration, encouragement and help both financial and otherwise. A similar debt of gratitude is due the other companies of the 1905th, and to the officers and men of the 209th Engineers who were camped close by The Road. "These men will be remembered not only by me, as my special friends and benefactors, but also by all the Kachins in this district with whom they come in contact. For example, when Little Rose, a Kachin baby who came into this world with a few extra fingers, grows up she will be eternally grateful to Capt. Ambrey and his medics who removed these unsightly growths from her hands. "All these men can return to the States happy in the thought that apart from playing their part in the construction of the world-famous Stilwell Highway, all the help they have given to us missionaries and the people with whom we live and who constitute our "flocks" will always be remembered and deeply appreciated." 'FRUIT SALAD' EXPERT Blouses and coats of British generals, American G.I. 's and officers, and an order for decorations from Generalissimo Chiang Kai-shek mingle in profusion on the arms and shoulders of Dennys Gasper, New Delhi military tailor. He is a keen student of military decorations. The man who quite likely is partially responsible for seeing justice done in the way of awards and recognition for airmen in general and Hump flyers in particular is a suave, English-accented, baldish chap by the name of Dennys Gasper. Mr. Gasper is general manager of Phelps, the military and civilian tailor in New Delhi. He is crazier about a uniform than your kid sister back home. His bland face takes on an expression of pre-war Viennese gemuetlichkeit when the subject is broached. Which broach it we did when we heard the anomalous statement that a "furrier" had had something to do with our own Air medal and the Presidential Citation for flying the Hump. Here's about the way it happened, according to Mr. Gasper. Three years ago a Capt. J. McKeown, a Hump flyer himself, apparently thought it was about time somebody started to notice the boys who were hurdling that death-dealing obstacle in the fight to keep China in the war. He thought it might be a good idea, and good for morale, too, if some sort of medal or ribbon could be gotten up and given to those deserving it. Accordingly, he flew up to New Delhi to arrange the fashioning of such an award with Mr. Gasper who, he was told, was an expert. A ribbon was worked out to be given all flyers of the Hump who had performed the feat 13 times. One could hardly say the number 13 was chosen as an incentive in those perilous days, but the ribbon represented more a token of extraordinary good luck than anything else. "But these daredevils started to wear the ribbon as an authentic decoration," Mr. Gasper said. "The manner of presenting them was very informal. A party would be held for the men who had performed the unusual feat and then the ribbon would be presented." "Then Gen. Stilwell heard about it and came down with a heavy hand on the practice," Mr. Gasper continued. "He put out a special order prohibiting the wearing of unauthorized ribbons." Meanwhile, Capt. McKeown had written to Washington requesting recognition of the ribbon, but was refused. However, a few days later, the Air Medal, commemorating 100 hours of combat flying, was announced, and that was followed by the announcement of a Presidential Citation for Hump flyers. Mr. Gasper admits that neither was like his own creation, but he figures he helped encourage the War Department to do right by airmen. Besides this, the dapper executive designed the hat and combat jacket which are official for the CBI. Stilwell had noted the farrago of head gear that the men of the CBI sported on their G.I. noggins. This was an irregularity which Uncle Joe was bent on correcting by sending his aide, Col. Phillip Dorn, to confer with Mr. Gasper. Mr. Gasper produced a few designs, one was selected, and was then placed on issue in Quartermaster and became known as the Col. Dorn cap. 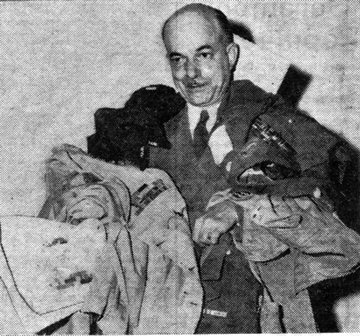 The combat jacket was also produced by Mr. Gasper at the behest of Stilwell, and was sent through Services of Supply to the U.S. where it was manufactured for authorized distribution. Gen. Stilwell was fond of giving the Chinese forces silk banners inscribed with Chinese characters every time they won a battle. For this he also employed Mr. Gasper. Gen. Frank Merrill had him do the same for Chinese forces with which his Marauders fought in Burma. Mr. Gasper designed the Marauder patch and, and he says the General, whom he knew as a major, never comes to Delhi without popping in to see him. Mr. Gasper has been designing and making ribbons and other military decorations since 1911, and has served the military great from the Duke of Connaught up to practically all the Generals and Admirals who have fought in this part of the world. When we left, Mr. Gasper was mulling over an order for ribbons which will decorate the facades of the Chiang Kai-sheks. The Roundup is a weekly newspaper of the United States Forces, published by and for the men in Burma and India, from news and pictures supplied by staff members, soldier correspondents, Army News Service and United Press. The Roundup is published Thursday of each week and is printed by The Statesman in New Delhi and Calcutta, India. Editorial matter should be sent directly to Major Floyd Walter, Hq., U.S.F., I.B.T., APO 885, New York, N.Y., and should arrive not later than Saturday in order to be included in that week's issue. Pictures must arrive by Friday and must be negatives or enlargements. Stories should contain full name and organization of sender. Complaints about circulation should be sent directly to Capt. Drexel Nixon, Base Section APO 465, New York, N.Y. Units on the mailing list should make notification of any major change in personnel strength or any change of APO.